First off, make sure you are saving pea seeds from a well-established heirloom variety so you'll have the best chances at success. There are quite a few heirloom pea varieties available to choose from. For regular garden peas, Thomas Laxton and Lincoln are both good heirloom varieties. For a sugar pea variety, Mammoth Melting Sugar is a good heirloom choice. 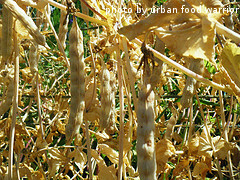 Pea seeds are easy to collect and save for re-planting next year. In fact, mother nature will do most of the work if you let her. For best results, you want to leave the peas on the plant until they dry out. The pods will turn brown and brittle and when you shake the pod, you should be able to hear the hardened seeds rattling around inside. If you wait too long, the pea pods will burst open and spill the pea seeds on the ground. If it's dry and you witness this phenomenon, you can still collect the seeds from the ground. After you pick the pods and gather the seeds, bring them inside to dry out a bit more. Remove the pea seeds from the pod and spread them out on foil or a baking sheet and let them air dry for another couple of days. Go ahead and inspect them for any signs of mold and discard any seeds that don't look right. When they are done, you want the seeds to be hard and shriveled up a bit. Then you can then put the seeds inside an envelope and store them in a jar in your refrigerator. Make sure you label the envelope so you know what seeds it contains. 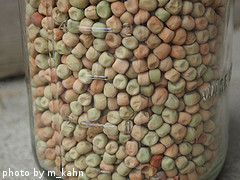 If you are saving lots of different seeds, several envelopes can fit inside one, quart-sized jar. It's also a good idea to put a tablespoon of dry rice at the bottom of the jar just to absorb any moisture. If you are saving lots of pea seeds, don't worry about the envelope and just store them in the jar with the rice in the fridge. Click on the following links to learn more about growing peas.